This is a pretty fun app. The only thing I suggest is letting us be able to move homes into different lots and sell things quicker (like you tap all the items you want to sell and the quantity of them instead of going one by one) thanks! So, umm exactly. This game if pretty iffy. I have been playing this game for almost 2 years now, and it seems like I have gotten nowhere. 1) Simple things on quests take forever to do! I mean, 3 hours just to talk to someone?! Come on, please fix that. 2) There aren’t many children’s clothes and teen clothes. The outfits they have are limited and it’s boring having them look the same all the time. I would think it would improve he game a lot if you fixed that. 3) I have read a lot of the other reviews on this game, and they are all saying the same thing as me. We all have a common problem in this game. So if you would fix these, thank you Thank you for taking your time to read this, but would you also take your time to fix the game as well, please. 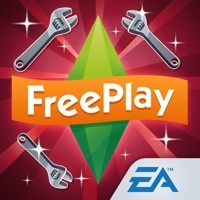 Thank you from all the Sims FreePlay players. This game feels more like work than a game. And, the on screen type is so so tiny even on my large XR. 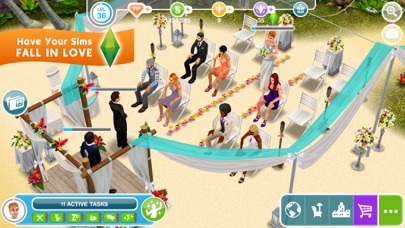 Will go with Sims Mobile instead. 😭I don't mind the ads, but some of them cause my game to close and when it does, their actions get cancelled ( so when I'm 8 hours into a 16 hour quest, it cancels the action completely and I have to start again ( same with work, etc. 😭). Please fix this. I really enjoy this game but will probably give it up soon if this keeps happening. Not that I hate it.. This game is good and all but I honestly don’t like how the faces look. There is too much shade. People, you can play this game, it’s good and all but.. this is just my opinion. Don’t listen to other reviews! 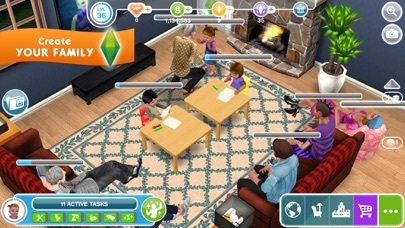 Better than the Sims Mobile. The Sims FreePlay is honestly a break from life, and...The Sims Mobile. Please don’t be discouraged by the way the Sims look. If that’s all you care about, then I suggest you go back to the Sims 4 where everyone looks like a cartoon character. Sorry, but I have a lot of problems with the Sims franchise. Especially The Sims 4. 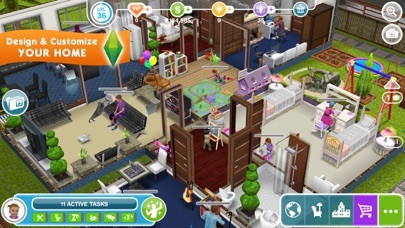 If you’re tired of The Sims Mobile, it’s understandable. I’m pretty sure that there are two different developing teams for these games, because they are so different. The Sims Mobile feels so greedy and wanting; They recently took away a hairstyle just because they made a mistake and gave it away to players by accident. 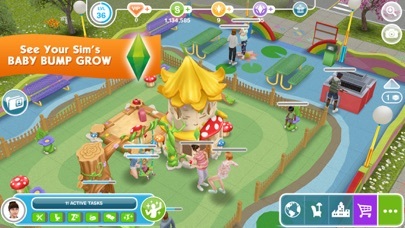 The Sims FreePlay, however, is a break from that. 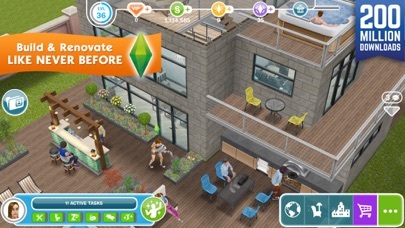 I loved the Sims Mobile and all its beautiful glory. The diversity and cool graphics drew me in. I never really payed attention to FreePlay, so I was constantly focused on Mobile. Anyways, when I came across it again a few months ago, I thought, “Woah. Their faces!” It was a shocker coming back from the glamed up version of The Sims Mobile, but it was worth it. Sooo worth it. I started playing and wasn’t too impressed by the clothing options. I kinda laughed at the way they walked. But then I got past that and the loading screen and realized the amount of attention and detail that went into making this game is truly incredible. It blows my mind. For instance; In the Sims Mobile, when Sims turn on a T.V, they stand there. Watching a blank screen. In the Sims FreePlay, an actual VIDEO plays. On their screen. Of course, it is the same almost every time, but that small detail counts. It feels so realistic compared to The Sims 4 and the Mobile version. While they look polished, FreePlay is working with older software and graphics from around 2009(ish)-2011, so around the Sims 3 - and somehow, it’s a much better game. There’s also a lot more interaction and you sort of play God here, just like in the P.C version. You can buy a prebuilt house, or build it yourself. You create the world around you, just like in the P.C version. It’s so much for so little, and I’m really happy we can play it for free. I don’t want to give the quests and extras away because I think those are for the player to find out, but it’s definitely worth your time if your tired of The Sims Mobile Side Note - People say that there are tons of ads, but I do not have this problem. Some other issues that you may have could deal with connection. You WILL need a wireless connection to play this game; If you do not have a steady one the game will not work. Have fun playing!